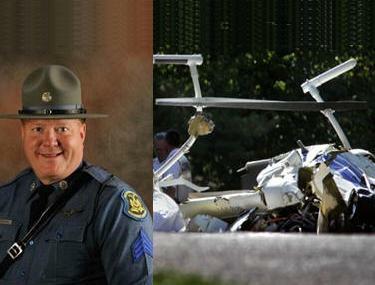 January 13, 2012 - NTSB's investigation completed on Missouri Highway Patrol helicopter, Bell 206B JetRanger, N96MP, that crashed near Clarkson Valley, Missouri killing private pilot, Sgt. Joe Schuengel, 47, concluded the helicopter ran out of fuel. Additional findings also indicate the pilot was on antidepressants and other medications that wer not reported on his medical. Schuengel had accumulated 2,607 hours of total flight time, of which 820 hours were in the make and model helicopter. The flight departed from Arnold, Missouri, about 10:53 AM and was en route to Spirit of St. Louis Airport, St. Louis, Missouri. On October 15, 2010, two Missouri Highway Patrol Troopers arrived at the Arnold Police Department, located in Arnold, Missouri, about 8:45 Am, to fly with Schuengel on a speed enforcement operation in the accident helicopter. The patrol troopers saw the helicopter approach from the east and land in a field just south of the police department shortly before 9 AM. Shortly afterwards the flight departed from the field and headed towards interstate 55. The trooper who was seated in the front seat stated that while the helicopter was en route he observed that the fuel gauge was ?slightly above 25.? The trooper stated that Schuengel pointed to the altimeter and said that the altitude was 1,500 feet. The trooper also stated that the pilot said that he would not be able to ?stay up as long as normal? because he would have to obtain fuel before his next flight in Franklin County at 12 noon. After over an hour of flying, Schuengel informed the troopers that he would perform an additional speed enforcement, which was completed about two minutes later. While returning to the Arnold Police Department, the trooper in the front seat asked the pilot how long it took to fly from the Arnold Police Department to St. Louis; the pilot replied that it took about 10 minutes. When the helicopter landed, the trooper in the front seat noticed that the fuel gauge indicated ?half way between E and 25.? The pilot shut down the helicopter, and the two troopers aboard exited. The front seat trooper stated, that throughout the flight, the pilot made no statements about the helicopter not running ?properly.? The front seat trooper noticed ?no strange or unusual noises or actions? from the helicopter when it took off for SUS. A witness near the accident site stated that the helicopter was flying from right to left. He heard the noise of the engine ?sputter? and then ?stop.? The rotor had separated from the helicopter and they both descended. The helicopter fuselage was ?gyrating wildly? and ?seemed out of control.? Examination of the fuel system revealed that about 3 quarts of liquid consistent with JET A aviation fuel was present in the fuel tank bladder. The fuel shut off valve was in the open position, and it would open and close when a 24-volt electrical source was applied. The low fuel switch was also tested and was functional. The fuel float arm was intact and was moved by hand without restriction. The airframe fuel filter (volume of the fuel filter container was about 20 ounces) contained about 1 ounce of liquid consistent with JET A. The fuel line leading to the inlet of the engine driven fuel pump contained 2 drops of liquid consistent with JET A. The fuel lines were intact. The area surrounding the main wreckage did not contain evidence consistent with fuel spillage. An autopsy performed on Schuengel by the St. Louis County Medical Examiner?s Office revealed that the death resulted from multiple blunt injuries to the head, neck, chest, abdomen, and all extremities. In addition, Schuengel had traces of antidepressants, anti-anxiety and anti-inflammatory medications in his system (Alpha-hydroxyalprazolam, Alprazolam, Desmethylvenlafaxine and Venlafaxine was detected in his urine). A review of the pilot?s FAA Aerospace Medical Certification Division records revealed that his last application for a Second Class Airman?s Medical Certificate was made on May 27, 2010. The pilot answered ?No? to the question ?Do you take any medications?? He also answered ?No? to the question ?mental disorders of any sort; depression, anxiety, etc.? The Missouri Highway Patrol representative stated that the Troop C Command Staff, the Director of the Aircraft Division, and all personnel in the pilot?s chain of command had no knowledge of the pilot?s use of the medications listed in the FAA Final Forensic Toxicology Fatal Accident Report or his medical condition that would have been associated with their use.